I don’t care if you care or not, but tonight and tomorrow I’ll be glued to the Westminster Kennel Club 2008 Dog Show. 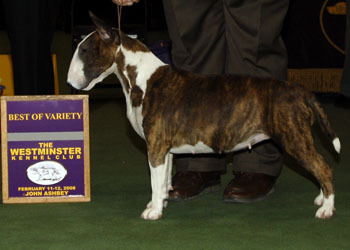 Clio didn’t enter, so I won’t be rooting for her obviously, but Ch Paradox Muse-Ic To My Ears just won Best of Breed in the Bull Terrier colored department, and this dog’s a beauty! WTF? I looked at USA channel and Westminster is only on for an HOUR and then they’re going to wrestling! Coverage used to be almost 3 hours each night! It’s on USA for one hour, then switches to CNBC. If you don’t get CNBC then it repeats tomorrow morning on USA for all 3 hours, then concludes on USA for all 3 hours Tuesday. Annoying as hell, but at least I finally figured it out ! I saw it on last night and thought of you. I didn’t watch it, but I thought of you. Yay for the 15″ Beagle !! We saw history made tonight, folks. This is the first Beagle to ever win Westminster. Well, as long as the 2 poodles didn’t win… history would have been made. Several of those dogs, the Akita, Weinmareiner, had never won either. That was fun. As soon as they introduced the Top 7 dogs, as soon as the Beagle came on stage, I said, “He’s the winner.” That Beagle had a vibe to him, an air of confidence that filled that arena. The audience felt it. The judge couldn’t resist it. In fact, when they were judging the sporting breeds I had picked him to win that part of it. There was just something special about that dog. Hooray for the Beagle! As I’ve said, I have a fondness for Hound Group and I am especially fond of beagles.